But DeMo is his ultimate test. If he learns from this, his next two years may still be his best. On the morning of May 19, 22-year-old Tibetan monk Jamyang Losal set himself alight in Qinghai province’s Tsojang Tibetan Autonomous Prefecture. Losal, who died at the scene, was the 150th Tibetan to set himself on fire in protest against Chinese policy on the Tibetan Plateau since 2009. He had previously been detained for 10 days for posting a photo of the Dalai Lama on the heavily monitored messaging service WeChat. After this fiery act of protest, he was taken away again for the last time by police, who refused to return his body to his family. Ever since 1989 and the Tiananmen Square protests, the Chinese state has explicitly prioritized “stability above all else” (wending yadao yiqie). The goal of this policy is an authoritarian feedback cycle combining political and cultural controls from the top with rapid economic growth from below that theoretically produces bottom-up support for the party-state. This stability drive targets any potential source of political, cultural, legal, or spiritual opposition and paints its foes, particularly in Tibet, as “cultic.” But this drive for stability has become a cult itself, one backed by the state: a totalitarian form of belief that refuses all counterevidence or opposition and that must be embraced regardless of consequences. This cult is locking people in Tibet, both Han Chinese and Tibetan, into a downward spiral of anger and pain. For Hezbollah, revenge seems to be a dish best served cold. After an explosive device concealed in a vehicle killed the Lebanese militant group's leader, Imad Mugniyah, on Feb. 12, 2008, reprisal attacks looked all but certain. Hezbollah, after all, could hardly let such a high-level assassination go unanswered. Then on June 8 of this year, nearly a decade after Mugniyah's death, the U.S. Department of Justice announced that it had arrested two Hezbollah operatives in New York and Michigan. One of the suspects, Ali Kourani, appears to have played a part in planning the long-awaited retaliatory strike. The criminal complaint against him accuses Kourani of conducting surveillance against various targets, including individuals connected to the Israel Defense Forces (IDF), in preparation for an attack avenging Mugniyah. Though the attack never materialized, the information Kourani passed back to Lebanon in the course of his surveillance operations could provide the basis for a future act of terrorism. The case, moreover, offers insight into Hezbollah's workings and highlights the distinctions between its tactics and those of its peers in the world of Islamist militancy. TALLINN, Estonia – NATO reinforced its position as a leader in the cyber-threat battle space when it officially recognized cyberspace as a domain of war in July 2016. In a similarly significant action, the Western Alliance adopted the position that international law, as has been the case in conventional warfare, also applies in cyberspace. A fundamental challenge faced by NATO, particularly in the development and deployment of effective defensive and offensive cyber weaponry tools, is how to optimize collaboration with the cyber intelligence infrastructures of member nations in responding to attacks in an ever-changing cyber battle theater. On the strategic-response side of NATO’s cyber warfare operations, the organization must grapple with the omnipresent operational concern about whether it is better to have a good defense or a strong offense. The Alliance’s evolving strategic direction to counter threats against critical military and civilian network infrastructure in cyber space was outlined by NATO chiefs at the four-day Cyber Conflict (CyCon) conference in Tallinn, Estonia that ended June 2. At the end of this month, Prime Minister Narendra Modi will head to the US to meet President Donald Trump. Nothing earth-shattering is likely to happen during the visit but it is conceivable that this might just end up being the defining visit of Modi’s US policy in the age of Trump. During the campaign, in a first for a US presidential candidate, Trump attended an Indian-American event organized by the Republican Hindu Coalition, termed India as a “key strategic ally” and promised that if voted to power, India and the US would become “best friends”. His hard-line position on Pakistan and Islamist extremism also endeared him to a section of Indians. But since he became President, Trump has given mixed signals about his priorities, confusing many in India. Though his aides have often delivered tough messages to Pakistan about terror, his approach has been erratic at best. In a phone conversation with Pakistan Prime Minister Nawaz Sharif, he seems to have told him that he was ready to play any role desired by Pakistan to resolve the country’s outstanding problems. Trump told Sharif that he has a “very good reputation”, is a “terrific guy” and is doing “amazing work which is visible in every way”. In his usual hyperbolic manner, Trump is reported to have said that Pakistan is “amazing, with tremendous opportunities” and “Pakistanis are one of the most intelligent people”. The US ambassador to the UN, Nikki Haley, went so far as to say that the US may play a proactive role in de-escalating tensions between Islamabad and New Delhi, though this was later dialled down by the state department. 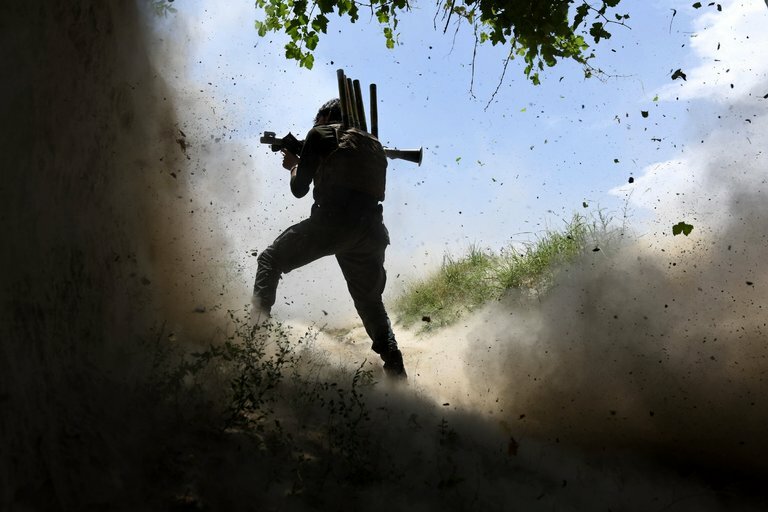 KABUL, Afghanistan — Tora Bora, the mountain redoubt that was once Osama bin Laden’s fortress, fell to the Islamic State early Wednesday, handing the extremists a significant strategic and symbolic victory, according to Afghan officials and local elders and residents. Taliban fighters who had previously controlled the extensive cave and tunnel complex fled overnight after a determined, weeklong assault by the Islamic State, also known as ISIS or ISIL, according to villagers fleeing the area on Wednesday. Hazrat Ali, a member of Parliament and a prominent warlord from the area who helped the Americans capture Tora Bora from Al Qaeda in 2001, said that the offensive was prompted by the American decision to drop the so-called mother of all bombs on an Islamic State network of tunnels in Achin District in April. The 20,000-pound bomb was thought to be the largest non-nuclear bomb ever deployed. Pakistan: U.S. Drone Strikes "Against Spirit of Ongoing Cooperation"
Pakistan’s Chief of Army Staff General Qamar Javed Bajwa said today that US drone strikes and other unilateral actions “are against spirit of ongoing cooperation” and that any intelligence on terrorist whereabouts should be forwarded to the army for action. Bajwa made the statement despite the fact that Pakistani officials have routinely passed along actionable intelligence to terrorists to help them avoid raids, as well as supposed “counterproductive” drone strikes have historically been effective in killing scores of top tier terrorist leaders. June 13, 2017: China has a grand strategic plan and it’s no secret. For the last few years Chinese officials have been describing their economic and military expansion plan as Obor (One Belt, One Road). A new PR campaign for Obor describes it as a revival of the ancient “Silk Road” but that’s not accurate as the ancient Silk Road was only partially run by the Chinese. Most of it was operated by other major powers (Iranian, Indian and Arabs) and was largely put out of business after the 16 th century by European innovations in ship building and management of sea routes that presented a safer and cheaper way to move goods worldwide. Moreover, until the late 20 th century Chinese leaders never encouraged (and often banned) foreign trade. For most of Chinese history the leaders believed China had all it needed (largely true) and considered all non-Chinese and their products as inferior. The big change now is that China needs international trade and Obor is the Chinese plan to control as much of it as possible. This is essential for a prosperous economy because without that the communists are in big trouble. Obor means China owning or otherwise controlling as many of the new roads, railways, ports, pipelines and sea routes as possible. China is investing nearly $200 billion in Obor construction. This includes land routes through Central Asia to Europe and the Middle East, another through the Himalaya Mountains to the Indian Ocean (soon to be under new management if China has its way) and new land connections into Southeast Asia. The key to China’s new sea routes is asserting ownership of the South China Sea. China Electronics Technology Group Corporation said it has flown 119 fixed-wing unmanned aerial vehicles simultaneously, the state-run Xinhua news agency reported. The Chinese drone maker Ehang sent a squadron of 1,000 drones into the air earlier this year, state media reported, but they were powered by rotary wing technology. No details were given in the report of where or when the Chinese company made its record attempt. The company, one of the main suppliers of electronic equipment to the People’s Liberation Army, told Xinhua that the technological breakthrough put China in a leading position on the large deployment of drones. The machines were launched in several batches using a power-assisted take-off system similar to those used by fighter jets on aircraft carriers, according to the report. US Africa Command, or AFRICOM, announced that it targeted a “command and logistics node at a camp located approximately 185 miles southwest of Mogadishu in a stronghold for the al-Qaeda-affiliated al-Shabaab organization” in an airstrike. AFRICOM assessed that eight Shabaab operatives were killed. As the WannaCry ransomware spread across 150 countries last month, the Middle East held its breath. While Saudi Telecom Co. (STC) denied that the virus had affected its systems, it was another stark reminder of cyber security risks that loom large over the region, and the GCC in particular. After all, the GCC represents an emerging information environment with accompanying economic, social, and security promises and challenges. With cyberattacks being increasingly wielded as asymmetric weapons of war, robust and proactive cybersecurity structures will undoubtedly be an essential component for securing both regional influence and stability. The Gulf is a lively cyber conflict zone. According to Symantec's annual Internet Security Threat Report, Saudi Arabia and the UAE are the two most targeted MENA countries for ransomware attacks – in which cyber criminals steal and encrypt files until a ransom is paid. In a bombshell report on Monday, The New York Times revealed just how difficult the cyber war against the Islamic State (ISIS) has been, along with a remarkable success in hacking ISIS with the help of Israel. "Top Israeli cyberoperators penetrated a small cell of extremist bombmakers in Syria months ago," the Times quoted U.S. cyber officials as saying. "That was how the United States learned that the terrorist group was working to make explosives that fooled airport X-ray machines and other screening by looking exactly like batteries for laptop computers." The Times' David Sanger and Eric Schmitt reported that this intelligence was "so exquisite that it enabled the United States to understand how the weapons could be detonated." One of the major concerns following Brexit was that Britain’s departure from the European Union would be detrimental for the financial sector in the U.K. and the EU, since London is a financial hub. Those who hold this view would see the European Commission’s new plans announced on June 13 to regulate a very lucrative industry in London’s financial sector as a case in point. But this fails to recognize that both the U.K. and the EU will be able to adjust to the new circumstances and do not want to see a massive shake-up in the sector. The proposed plan would allow the EU to regulate clearinghouses that settle certain types of euro-denominated contracts and which are located outside the EU. Clearinghouses act as a middleman between buyers and sellers of derivatives; they ensure that transactions are completed smoothly and bear the cost if one of the parties doesn’t hold up its end of the deal. They therefore help ensure that the effects of a default don’t spread to the rest of the financial system. The London Clearing House, which is partly owned by the London Stock Exchange, is the global leader for the euro clearing business. It clears roughly three-quarters of all euro-denominated interest rate derivatives transactions. Since this is a substantial portion of the global business, what happens in London could have a significant impact on the stability of the eurozone, even though the U.K. doesn’t use the single currency. For this reason, the European Central Bank insisted in 2011 that euro-denominated derivatives trading should take place only in the eurozone. Eurozone countries had argued that the LCH made the debt crisis even worse by raising its margin requirements (the amount that buyers and sellers are required to hold in an account as collateral against derivative contracts) on debt for Spain and Ireland. The U.K. challenged the ECB in court and won. The Free World appears to be in trouble, says Daniel Fried. Indeed, aggressive authoritarians and newly-emboldened nationalists are challenging the very foundations of a rules-based, democratic international order. Given these dangers, Fried believes it’s important for us to remind ourselves what the Free World achieved, where it has gone wrong, and what democratic forces can do to help restore it. Ideas have power, not all ideas and not under all circumstances, but the idea of a liberal world order demonstrated its power at two turning points: the resurrection of the West after World War II and the expansion of the West after the fall of Communism in Europe in 1989. The phrase “liberal world order” sounds like the invention of a political science seminar. It may be better to call it the Free World Order, as the Free World—its values, institutions, and purposes—remains the best organizing framework for humanity in the twenty-first century. The researchers compiling the U.S. Army’s accounts of Iraq and Afghanistan have an overwhelming yet spotty volume of material to work through. What will it take for the Army to succeed in multi-domain battle? The Army is facing a critical juncture in sustainment of communications and information technology equipment. The service is realizing it must change its posture to potentially fight an amalgam of actors in a complex battle space leaders call the multi-domain battle. In her role as director of the Integrated Logistics Support Center for Army CECOM, Liz Miranda has a key role in helping the Army succeed in multi-domain battle. C4ISRNET Reporter Mark Pomerleau caught up with Miranda at her office at Aberdeen Proving Ground in Maryland for her first interview since assuming her new post. Miranda discussed her role in the Army’s sustainment and logistics. Can you describe what you’re responsible for and what your office does? We are responsible for providing integrated logistics and integrated logistic sustainment and acquisition support for [command, control, communications, computers, intelligence, surveillance and reconnaissance] systems. The responsibility of what we call integrated logistics sustainment — it’s not just ... having the right part in the right place at the right time and the movement of those. It is the planning, the projection, the actual procurement of the parts, the delivery of those parts, and that is just one aspect. LITTLE ROCK, Ark. -- If disaster strikes the U.S. homeland, a new network communications tool suite will enable Army National Guard Soldiers to provide first responders with network and phone communications, even when local infrastructure has been destroyed. "In a disaster situation, interoperable communications between the military, first responders and other [non-government] agencies is always critical," said Maj. Gen. Timothy McKeithen, deputy director for the National Guard. "Lessons learned from Hurricane Katrina [taught us that] it's all about timing -- a few minutes, compared to an hour or days, in communicating is huge when it comes to your property, life and family members." Under initiatives such as the so-called third offset strategy, which on a basic level imagines humans and machines teaming together to overcome the parity competitors have reached with American capabilities, artificial intelligence will be a critical component. For humans, however, learning to trust machines is a real challenge. “A lot of AI today is a black box, you have this neural net that you put in the inputs, it spits out an answer and 90 percent of the time it’s right. But that last 10 percent, sometimes it really screws up,” Defense Advanced Research Projects Agency acting Director Steven Walker said Wednesday at the Defensive Cyber Operations Symposium in Baltimore, Maryland. Walker's predecessor, Arati Prabhakar, last year at the Atlantic Council displayed a picture of a baby holding a toothbrush that a machine identified as a baseball bat. This could have mortal implications if a drone feed misidentifies a rake for an AK-47. During a keynote presentation June 14 at the Defensive Cyber Operations Symposium in Baltimore, Steven Walker, acting director of the Defense Advanced Research Projects Agency, outlined three research areas his organization is focusing on in cyber. 1. Hardening systems against attacks. Walker referenced the Cyber Grand Challenge that was held last August as an example that could represent a paradigm shift in the way cyber is currently thought of. The challenge, he said, sought to defend a network and counterattack an adversarial network in a matter of minutes without human intervention — essentially machines versus machines in virtual capture the flag. To maintain a decisive edge over the enemy the Navy must accelerate its operations and how it develops as a service, particularly when it comes to dealing with big data, according to top naval leadership. With the rapid advancement of technology, more and more devices are gathering and feeding data throughout the web. As these connections progress, more information will be brought forth and with that information comes “a new age of cognitive computing decision, and cognitive assistance, machine assistance, to help us make sense of all that data,” Richardson said. Almost simultaneously as patches are released, adversaries are probing Department of Defense networks, according to Col. Paul Craft, commander of Global Operations Command at the Defense Information Systems Agency, which is responsible for global DoD network boundary defense. Even adversaries know about “patch Tuesday," Craft said during a June 14 panel at the Defensive Cyber Operations Symposium in Baltimore, Maryland. “We all know that patches come out and we know that it’s our responsibility within the DoD to get it patched quickly. I’ll tell you as the command that runs the boundary: We are immediately scanned for any of those vulnerabilities … by our adversaries." The adversary receives the same patch notice releases as everyone else making, it a known vulnerability, he said, and they're going after these patches an hour after they're released.